The ad above isn't related to this post. Just in case you were wondering. I wanted to show you some of the changes we've made to our home's layout and furniture arrangement. I showed you some "before" pictures and mentioned that (a) we never used our dining table because it was inaccessibly stranded in the dining nook, (b) the shelves of toy bins weren't being used effectively, and (c) we wanted to go for more of a Montessori vibe. Look — I wrote on the pictures! How twee. IKEA kids rug — I was hoping for a small wool rug, to be honest, because I believe they wear better, but the patterned rugs were so cute, and relatively inexpensive. We've already got play dough irreparably embedded into the fibers, but that just proves the space has been used well. IKEA kids table and chairs — I should just go ahead now and admit: Every single dang thing in this picture is from IKEA. Ok. We wanted a child-sized set for crafts and snacks. We use it, as mentioned, for messy things like play dough and painting. Mikko hasn't gotten the hang of using it regularly for play and prefers the couch. But maybe Alrik…? It did come in handy at the holidays when we had too many people over to fit around the dining table, because we could shuffle the big(ger) kids on over. IKEA bookshelf and bins — to hold books and toys. We'd eventually like to swap this shelf with one we found used that is not by IKEA (I know!) but looks similar, only smaller — nine smallish cubbies total. Right now, that one's up in the kids' room, but we were hoping to switch them at some point. Then most of the toys and books will be upstairs, and only what's immediately needed will be down. I think everything will look more breathable then, and we'll once again be able to see the artwork hanging on the wall behind the shelf. Besides toys and books in this shelf, there's a bin for computer cords and other paraphernalia, one for games, and a cubby just for library books. On top of the shelf live the dollhouse and the dress-up box. Kids books aren't particularly arranged except that German-language books and English-language books have separate cubbies. So they won't fight. Just joking. Every house, no matter how small, needs a conservatory, if only to provide an ideal location for candlestick-related murder. However, ours is of the musical variety (the conservatory, not the murder). And probably shouldn't be dignified with the name "conservatory" at all. 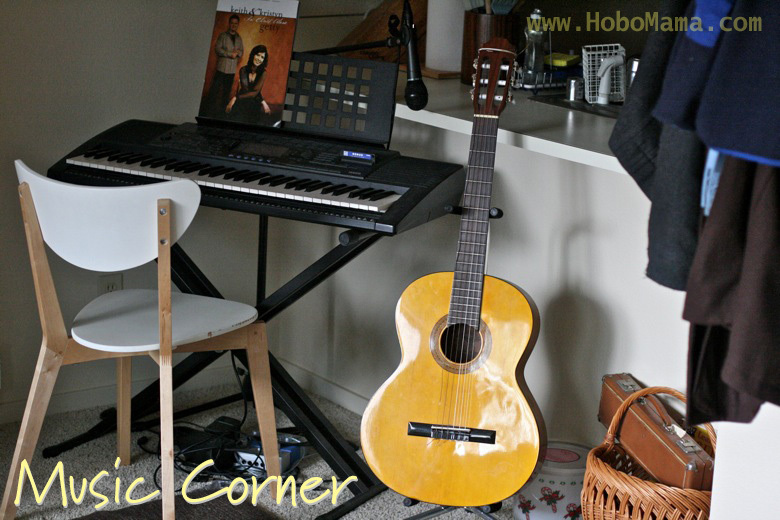 All right, let's call it the Music Corner. Oh, look — the picture already says so. Well, that's convenient. Drum — Sam found a cute wooden one at Goodwill Outlet after this picture was taken, but we also have an improvised drum out of an old popcorn tub and a cookie-tin lid (to the left, behind the guitar). Glockenspiel — we have a decent wooden one from the consignment shop, but I'd love to find a metal one with good tones somewhere. Some children's glockenspiels aren't in tune, which is rather pointless. Kazoo — hum a few bars. Claves — which I just now found out is pronounced clah-vays. Because they're for Latin music. Ahhh. Try picking up instruments here and there at yard sales, thrift stores, craigslist, and little shops. Sometimes a real music shop will have a cheaper version of an authentic instrument as opposed to a toy shop's super-priced "kid" version. There are sets you can buy that could make a band starter kit . Small instruments make great stocking stuffers and occasional treats. You can also repurpose non-instruments like rattles, old pans, wooden spoons, and popcorn tubs — if it makes noise, it's game! 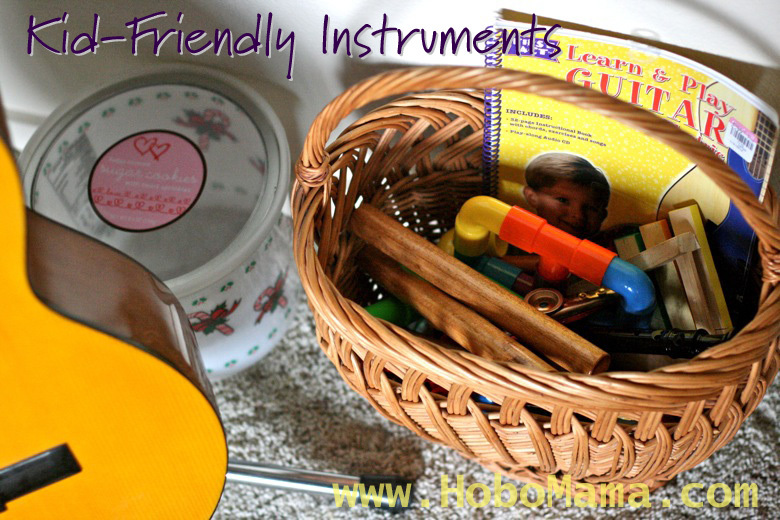 Most of these instruments can be played by babies, toddlers, children, and adults alike. Pick a song you all know to sing, pass out the instruments, and everybody jam along. Impromptu drum circle and music lesson, all in one! Note: Do not let kids take any of these instruments in the car, unless all you want to hear for the entire trip is loud percussive knocking or incessant kazooing. You've been warned. 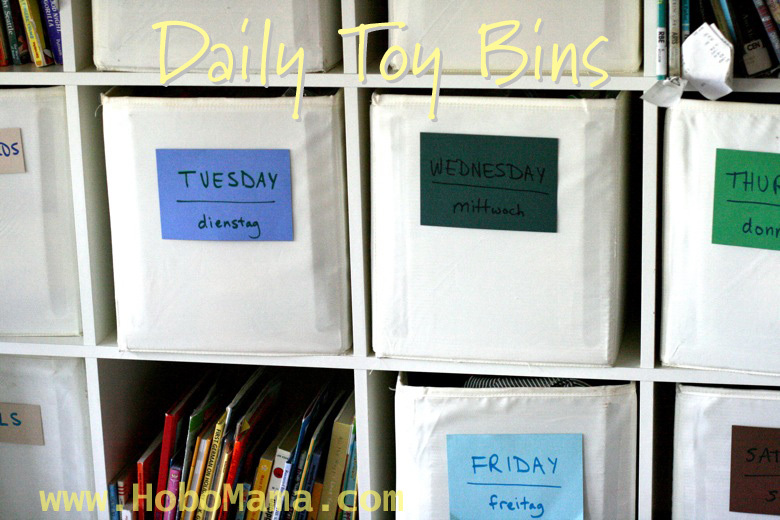 One way we've kept our toys under control in the shelf is through a newly instituted system of daily toy and activity bins. But I'll tackle that in another post! that will be up for a few days. This post is original, unsponsored, unrelated content. My comment got eaten somehow. I love the way this looks! And it's great to know that the silver beady thing that was my fave in music class is called an afuche/cabasa. Now I can buy one! Excellent!! I was telling a friend earlier how it seemed more practical move all the dangerous stuff and store all my plastic bowls, utensils and other kid friendly kitchen goods in my lower kitchen cabinets than lock them all up and have to correct her for her natural curiosity - it's one of my 10 m/o favorite places to play!! I think you should take suggestion from good knowledgeable person who has good knowledge of home renovation that is better for you really. Below is our website please once visit to website it will give you best ideas. What to use and why use for your home.